A load test is a test that measures the performance of a system based on the load of simultaneous users. The objective is to predict the maximum load that your application can handle. The load test or performance test: which highlights the sensitive and critical points of the technical architecture. The metrics that are taken into account in this type of load test are the following: response time, system load, database query, etc. Failover/Resilience Test: which simulates a failure during a load test to check the robustness. Spike Test: which is made to observe the behavior of the server(s) during a sudden change of load. Why and when to perform a load test? Carrying out a load test is necessary to avoid any failures of the application, servers and therefore websites. The objective is to satisfy your customers, to guarantee them a better navigation experience, but also to limit any loss of productivity. This ensures that your web applications run smoothly in all circumstances. Within Shift-Left move, it is recommended to integrate load test in project build factory and as a consequence automate as much as possible the process. Key steps to set up a load test: what methodology? Preparation of load test scenarios: define one or more sequences of actions performed by a real user. Launching the load test: a short pre-test is usually performed to ensure that there is no malfunction and then launching of the load tests. Contact us now to get this expertise! 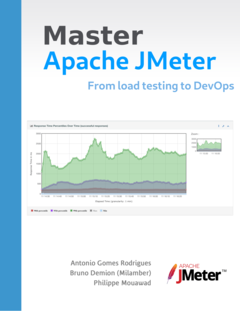 He is also the co-author of the book Master JMeter : from load testing to DevOps. The images used in this blog are used with the permission of the authors. We thank them for that !